Problem with my Cub 7304. Thought I had starter problems re no crank and starter would only click ( not rapid click but 1 click each time ignition turned to start ). Starter out and took it in for rebuild. Reinstalled and same problem. Took starter and battery out and took them in for checking. Checked all grounds and cleaned to bare metal.... same problem. Tractor will start and run ( with key in on position ) if I jumper between solenoid and starter. Cranks without fail and runs great. Many Cub Cadet models in the era of the Mitsubishi design have had a problem with starting. I have a model 7275 (5 indicates hydro) where the next newer model was 7305 (also with hydro). I believe your 7304 is a "gear driven" 30 HP model. They all had the same issue. The basic problem is the wiring for the starter. The wiring was set up that battery voltage goes from the ignition and through the various safety interlocks before going to the starter itself. Through all that wiring and switches a drop in voltage occurs. So, the 12 Volts drops to about 9 -10 volts which often isn't enough to engage the starter. As a kid, we had the same issue with our John Deere 55 combine and never knew how to fix it. We almost always had to tow it to start. Another poster on this forum, Larry Lutz shared a wiring diagram some years ago which had a solenoid relay in the system. Making this change solves the problem. I've done it to mine and passed this info on to dozens of others. Basically, the fix allows the current to go from the ignition through the safety switches but then goes to this solenoid relay. It only takes low voltage to trip this relay, but then gets power directly from the battery to the starter for a good 12 Volt current. I had my Cadet dealer do the fix, but if you are at-all electrically inclined, I'm sure you can do this as well. There are a number of postings about this issue if you check the archives. Someone also posted an alternative solenoid relay which is less costly than the Cadet one listed. Send an e-mail to badriver@badriverinc.com so I have you address, I'd be more than happy to send you this info in a .pdf format. Through this forum, I don't have a method to directly send you an attachment. Email sent to you. Looking forward to your response. I recently started having this exact same problem with my 6284. The post yooperpete made makes sense. Sounds like a modification I am going to need to make. I did the relay thing this last weekend - really helped my 6284 start better - particularly in cold weather. Does anybody have the diagram for this wiring? I have one of the 7305's, and I'm having alot of trouble starting it as well. Sounds like I'm having the same problem as all of you. I know I'm a couple years late, but I'd really appreciate it if anyone can help me out. I can't even get mine to start currently. I tried emailing the "badriver" guy but it said the email wouldn't go through (probably because of the fact I'm years late. Thank you. Does anybody have the diagram for this wiring?I have one of the 7305's, and I'm having alot of trouble starting it as well.Sounds like I'm having the same problem as all of you.I know I'm a couple years late, but I'd really appreciate it if anyone can help me out.I can't even get mine to start currently.I tried emailing the "badriver" guy but it said the email wouldn't go through (probably because of the fact I'm years late.Thank you. I have posted it somewhere before a long time ago. I will search to see if I can find it. Here is an explanation that I posted in another forum years ago along with wiring diagrams and photos. Some are mine and others are from other contributors. I purchased a Cub Cadet 6284 with the Perkins Cat diesel engine this spring. As the fall days have gotten colder I have found it increasingly difficult to start until it was becoming almost impossible earlier last month - not yet very cold by Michigan winter standards. The starter would either not engage at all or it would engage and crank the engine just to the point that it would kick over and then disengage before the engine was running. At first I suspected a weak battery, then connections, and even the starter, though there was just enough inconsistency to the behavior to make it difficult to pin down. 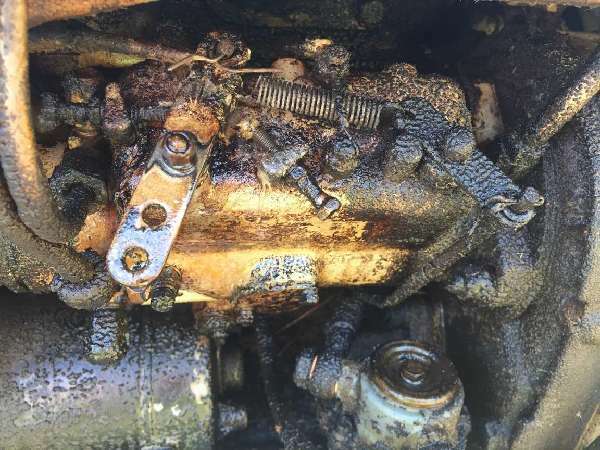 I was concerned about this to the point that I started searching the forums and discovered that this is not an unusual problem with Cub diesel tractors. One post explained that the problem was caused because the circuit that energizes the starter solenoid runs through all of the safety switches and can cause enough voltage drop that the solenoid will not engage. 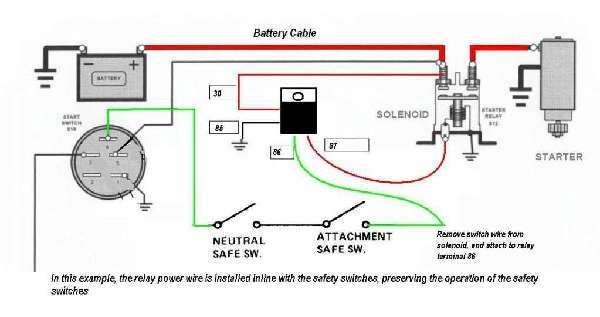 It also recommended that the cure for this is to install a relay switch that is energized by the starter circuit and connects battery power directly to the solenoid to provide full battery voltage. I installed a relay in the starting circuit this weekend and it definitely makes an improvement on how the tractor starts - especially when cold. I installed a 4 pin, 30 amp, 12 vold relay (Dorman part number 84601 - under $8.00 at auto parts store) and a 15 amp inline fuse on the battery side of the switched circuit. To energize the relay I took the small wire from the starter solenoid and routed it to the solenoid and grounded the other side. I then took battery power from the large positive post on the solenoid and routed it to the switched side of the relay. The other switched post I then ran to the small wire (energizing circuit) connection on the starter solenoid. See diagram at link listed in earlier post. I mounted the relay on the front of the bulkhead for the radiator (see photos). After installing the relay the tractor now cranks much better when cold without kicking out. It acts like the battery is much stronger and I believe this is because before the voltage would drop when the starter began to crank causing the energizing voltage to the solenoid to drop thereby disengaging the starter. Note that this modification does not defeat the safety features since the circuit that energizes the relay still runs through the factor safety switches.